Remove the pumpkin flesh with a spoon, and peal the sweet potato. Chop the pumpkin and sweet potato into 1 inch cubes. Slice the red peppers and put all vegetables on a roasting tray, with a drizzle of oil. Place in the oven to roast for 30-40 minutes, until soft. Allow all the vegetables to cool a little. 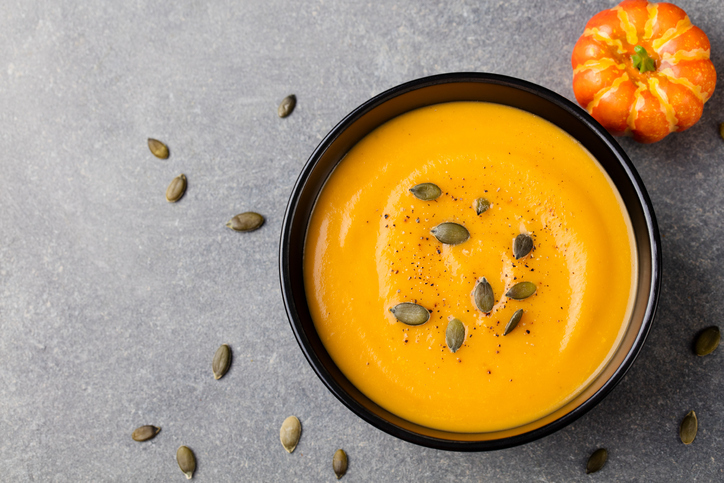 Once cool enough to handle, add the pumpkin, sweet potato and peppers to a blender with the water, milk and diced chilli, and blend until smooth. Pour into a saucepan and heat until piping hot, adding more water if you like a slightly thinner soup. Chef’s tip: To give the soup a sweeter flavour, roast the pumpkin and sweet potato until they are dark and caramelised. It is important to allow the veg to cool before putting in the blender as the pressure of the steam could create a mess in the kitchen! Use up: Use up some uncooked veg that you may have left over from another dish. Variations: To make this a more balanced dish, you can serve with garlic croutons or a few slices of bread and butter. You can also vary the ingredients buy using butternut squash instead of, or as an addition to, the pumpkin! Extra flavour: Adding your own mix of herbs and spices can really enhance this dish, such as coriander, cumin, oregano or fennel seeds. Vegan options: To adapt this dish for vegans, replace the milk with vegetable stock or coconut milk, both of which will create different flavours. Allergy advice: This versatile dish is easily adapted to avoid allergens and be suitable for most diets.